Another real estate school in your area has cut their prices across the board. Or, a lower-priced school has sprung up nearby. You can, of course, cut prices yourself. But what if your competitor offers a deeper price cut after that? If you counter with yet another, that could land you in a pricing war that drains your cash reserves and even becomes unsustainable. Instead of commoditizing your product, consider developing a competitive strategy that’s not based on reducing your prices. Here are five things you can do as part of that strategy. All they take is some legwork, research, and a bit of investment. Of course, your school is revenue-driven, but that revenue is derived from paying students who want to earn their real estate licenses. So students, not other schools, should be the focus of your competitive strategy, and you need to find out what they want. Survey former and current students and go to places (like high schools or technical schools) where you might find future students. Comb through the results to find out from students what they value in an educational experience. Match your capabilities to what they want from a real estate school and identify what you offer them that is unique. Then, with a little content marketing that demonstrates your knowledge of what students want and the value only your school can add, you will be able to get the word out. 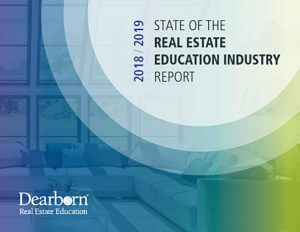 In our annual State of the Real Estate Education Industry survey, respondents from real estate schools agree: referrals are at the top of the list as an effective means of acquiring students. Part of your competitive strategy, therefore, should be taking time to strengthen your existing relationships with brokers, start new ones, and make all of them more effective. You can do that by talking to those brokers regularly, perhaps on a set schedule, to discover what would make it easier for them to send students your way. Investing in a simple postcard-sized handout the brokers could give to potential licensing students could make an incredible difference. Even more valuable would be an exclusive prelicensing discount added to the postcard developed for the broker that gives you the most referrals. Although technically, this is a price reduction, it’s like a coupon or special code to take advantage of an exclusive discount. It’s not an across-the-board price drop. The postcard and the discount are a win-win for all. You get more students, the student gets a discount, and the students will remember the broker who gave them the discount favorably and possibly join the brokerage after earning their license. You might already be posting regularly on social media. But, did you know that for a much smaller investment than slashing your pricing, you can make sure they’re seen by more people? Facebook makes it easy to market your school, and yet it still remains one of the best kept secrets for marketing services, products, and, yes, schools. You can ensure a wider reach of prospective students simply by boosting your posts and creating Facebook ads, all at a reasonable cost. A successful email campaign is not about investing in a platform that sends out as many emails as possible while you hope for a good return. You have to have a plan. The key to that plan is building a campaign around a targeted objective. That won’t cost you anything, and it will make a big difference. Meanwhile, your investment should be in growing your list beyond former students with care and thought. Determine your target audience and then figure out how to tell them you have what they need or want. For example, on your website, you could invite people to sign up to receive a newsletter, an ebook, or an electronic brochure with exclusive tips on starting a real estate career. Before long, you’ve developed an email list of leads who you already know are interested in you and your school. Look for opportunities to increase your visibility. Start with your state’s real estate commission or county board of real estate professionals. See if you can present at an upcoming meeting about a topic of interest to agents and brokers in your area. Consider sponsoring an event. These activities enable you to become more embedded in the local real estate community, which in turn exposes you to more real estate student prospects. You can also go outside the real estate community and participate in a charitable organization fundraiser, give a talk at a career day, or hold a free seminar about becoming a real estate agent. Be creative, and you’ll generate a great deal of interest.